Some of us just aren’t that talented: I can’t pull a 188 tonne plane; I can’t beat the highest score on Donkey Kong; and, until I grow a womb, get pregnant, and have triplets, it’s unlikely I’ll ever hold the Guinness World Record for heaviest birth. But everyone, even my crap self, can help break the record that Planetside 2 is aiming for. In fact, it’s essential that we do. SOE want to break the record for ‘Most Players Online in an FPS Battle’ and they need you to do it. The record attempt was first pitched to SOE by PlanetsideBattles, a group who organise giant pitched battles in Planetside 2 to stream on Twitch. 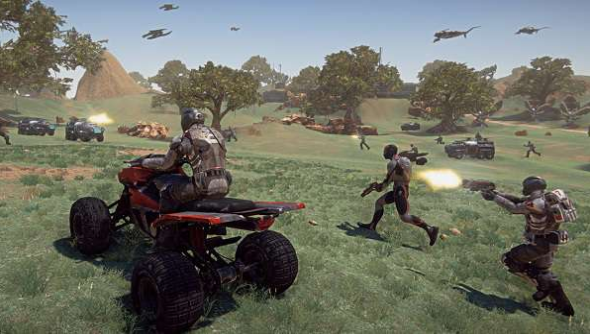 The original Planetside held the record until 2012 when Man vs Machine, a game created specifically to win the record, took it from SOE. “This record is for the greatest number of players simultaneously (in one single instance) in one server on an online FPS (First-Person Shooter) video game,” Guinness say. Man vs Machine’s record is 999 players playing in a single game. PlanetsideBattles want to get 1,100 people to take part in the attempt to take the record back. PlanetsideBattles are organising their attempt to take place on January 24 at 22.00 GMT. The match will take place on the Jaeger competitive server and anyone is free to join. For the full details on how to take part you should read the Reddit thread announcing the event.